When I was in middle school, I pleaded so much for a subscription to the Magazine of Fantasy and Science Fiction that one of my grandparents purchased a subscription to Galaxy Science Fiction. I suspect that they slipped into my room one day and grabbed a copy of whichever magazine I had laying around—at the time my only source of the magazine was a rack in the local drugstore, and some months they got Galaxy, some months SF & F, and other months Analog. It was in the pages of Galaxy that I first “met” Spider Robinson, who wrote their book review column at the time. The books he reviewed were books that either had just come out in hardback or were going to be coming out soon, so they were never books I would be seeing in a while. If a book wasn’t purchased by the local public library, my only option back then was to happen upon a paperback book when the family took a trip to the larger town (across the state line) where they actually had bookstores! Even though I often didn’t see the books he reviewed until years later, his book reviews gave me a sense of belonging to the sci fi tribe. And they were just fun to read! 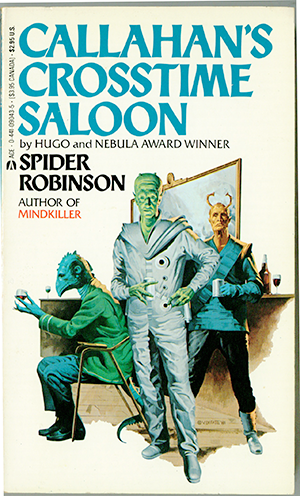 Robinson wrote his own science fiction, too. I believe I read a few of the Callahan’s short stories out of order as they appeared in the magazines. 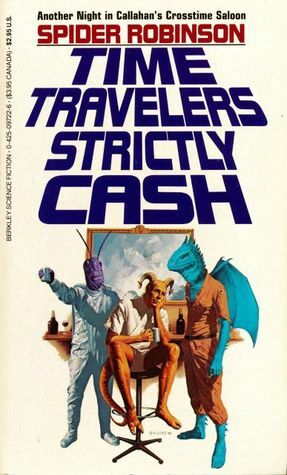 It wasn’t until I was in college when I found a copy of Time Traveler’s Strictly Cash in a used bookstore that I read a bunch of them in order. I immediately became an even bigger Spider Robinson fan. It’s hard to describe the Callahan’s stories. Most of them are set in a bar that somehow manages to attract aliens, time travelers, and various mythical creatures each lost in different ways. They were sort of like Twilight Zone episodes… except (almost) always uplifting. Originally, the Callahan stories were semi-standalone stories, most of which were published in the magazine Analog Science Fiction. The stories often illustrated the Law of Conservation of Pain and Joy (also known as Callahan’s Law): “Shared pain is lessened; shared joy, increased—thus do we refute entropy.” Robinson wrote the Callahan’s stories as ideas occurred to him, so he didn’t have a grand plan for continuity. So in the later books as he transitioned from short stories to novels things occasionally went off the rails. But even then, the stories had more than enough heart to patch over the plot holes. He’s also written novels outside of the Callahan’s universe. My particular favorites are Mindkiller and Telempath, though he is probably more famous for the Stardancer series written in collaboration with his wife, Jeanne Robinson. He’s won three Hugo Awards, a Nebula, the John W. Campbell Award, and the Robert A. Heinlein Award for Lifetime Achievement. So I’m not the only one who likes his work. I read pretty much every single thing he wrote from 1970s, through the 80s, and a bit into the 90s. He kept writing and still is writing. His most recent novel was published in 2008; he’s been reporting off and on about progress on his next novel on his web site, but he’s also been dealing with serious health issues (both his own and in the family), which has slowed him down. As I said, I kept reading everything he wrote into the 90s. Around 1993 or ’94 I found myself drifting away from Robinson. Some of it was just issues in my life. I finished coming out of the closet, I got divorced, and a lot of family upheaval happened. This is also the time period when, in my opinion, the Callahan stories started going off the rails. I had also come to the conclusion that I just didn’t agree with the philosophy that seemed to underpin every story he wrote: if only people could communicate more clearly, all conflict would cease. So I stopped reading his new material. I would still pull out my old favorites from time to time to re-read. In 2000, I read a book review by someone else (unfortunately I don’t remember who) of a new Callahan novel, Callahan’s Key. The reviewer mentioned a similar dissatisfaction that had caused him to stop enjoying Robinson’s writing around the same time I had quit. And the review said that this novel captured at least some of the old magic. The reviewer said the new novel was a joy to read. So I picked it up. And I read it, and it did have a lot of the fun of the earliest stories. It was not, in any way, a rehashing of them, though most of the characters make an appearance (and team up to save the world, literally). It reminded me of why I had loved his writing to begin with. I think what appeals to me most about Spider is his unabashed enthusiasm for the idea of science fiction itself. That came through in his book reviews, of course, but also in other essays, introductory material he wrote for the short story collections, but also in the stories themselves. I still remember one comment about Dune Messiah, the first sequel to Frank Herbert’s Dune: it had plot holes you could drive a truck through, but you didn’t care, because the rolling grandeur of Herbert’s vision swept you along. Robinson’s work epitomizes the giddy hope for a better tomorrow that is at the heart of some of the best science fiction. That exuberant expectation of better things to come is what first drew me to the genre. I’m grateful to have had Spider has a guide and companion in my own search of that wonderful tomorrow.